After nearly two years without as much as looking at a magazine, which is really unusual for me, I am back in the magazine-reading game. Me, the girl that religiously read issues from girl magazines and later on dived into the world of Glamour, Vogue and magazines of the like somehow stopped my regular purchases and completely forgot the existence of this beautiful world. Now that I am trying to think of reasons that could have possibly influenced this unconscious decision, I can think of a few that were probably the most important ones. First of all, I discovered that I prefer to read in English therefore I purchased the international editions of magazines, which due to import costs are more expensive than the national editions. Seeing as I am a student on a low-budget, it seemed only logical to save up some money and stop buying magazines on a monthly basis. Secondly, around my first year of university I picked up on reading books again, something that has quickly become a huge hobby of mine. With all the assignments, exams, socialising, Netflix and now also books, I didn’t feel the need to add magazines onto the already fully-packed list of activities. But then something changed. Ever since I arrived in London I gained an interest in my beloved magazines again. It all started with the weekly magazines that are distributed around London at train and underground stations, completely free of charge and such a delight to read during my lunch break and commute. I have honestly never seen such a vast amount of free reading material as London has to offer its citizens, these newspapers and magazine are of decent quality and yet they cost nothing! The big change, however, happened when I was waiting to board my flight to Amsterdam. I had some time to kill and decided to pop into a newspaper stand to eye up some books and magazines… When I first saw it I couldn’t believe my eyes, I stood there, looking at the magazine for nearly 5 minutes trying to let it sink in. 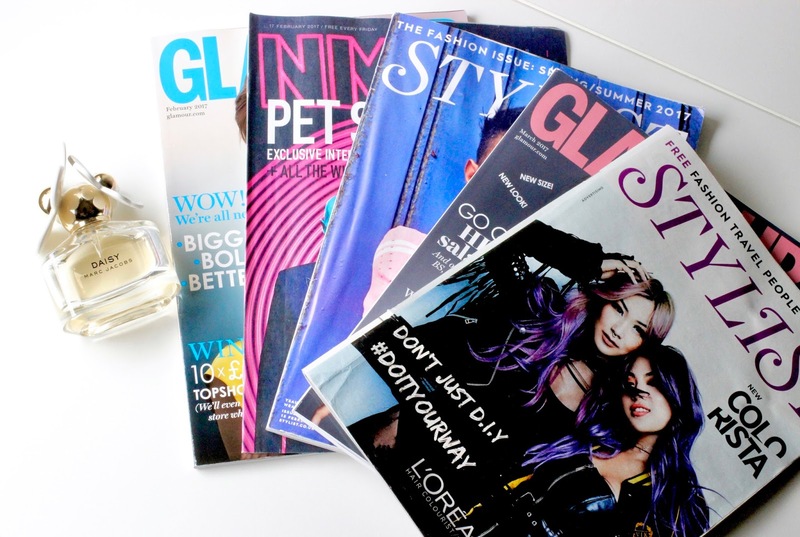 My all-time favourite magazine, Glamour UK, a magazine that I had been reading religiously for years before I quite reading magazines all together, now only costs £1 and is even bigger and better than before. Being able to read this magazine again, after so many years, knowing that it doesn’t cost me a supper, was so incredible. I’m currently reading my second edition and I can’t wait to see what more it has to offer! When I see how many people read the free magazines and newspapers, that are handed to them, meaning that people don’t have to take the extra step to get their hands on their favourite read, is amazing. I honestly think that the print industry will survive the takeover of the internet, even if it’s only because people don’t have to search for anything since articles are already selected. Personally, I enjoy reading print because it means that I won’t be staring at a screen for hours on end. I think it is important to give my eyes some rest and to look away from the electronics every now and then. As long as the print industry works on being as accessible as possible, they have a steady future ahead of them.